Sweet Mother offers you a stay at one of its five nice chalets. 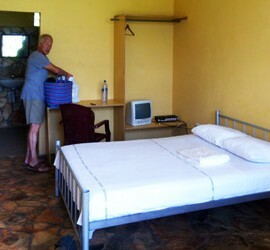 We offer 10 rooms with a fantastic view, double bed, ceiling-fan and bathroom. Relax at our pool, our restaurant, and enjoy our terrace. 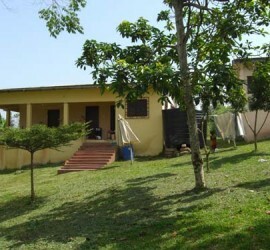 Sweet Mother is an eco-resort situated on 6 acres of land in the cool Akwapim mountains of Aburi, Ghana. Sweet Mother reveres to our planet and of course to our sweet mother who has suffered to give birth to us revering to one of the most popular songs in Africa, Prince Nico Mbarga’s “Sweet Mother”, released in 1976. Of course we offer hospitality, but our main goal is to be an awareness center to inform people what is going on, on our dear planet, the world we’re living in. In Ghana that awareness is not something common due to poor education and news broadcasts. We offer a stage and a studio, though they are far from perfect. The organic farm has to be expanded, the clay oven hasn’t been realized yet, the restaurant is still to be covered with glass for example. We’ve got more land to expand. There is another three acre of forest downhill where people can meditate or play drums. Volunteers and co-investors are more then welcome to join the Sweet Mother family here in the cool mountains in Ghana. Our resort features a swimming pool, various terraces, an outside bar, a restaurant, organic food, a children’s playground, arts facilities for performing artists and lots of different corners for activities. 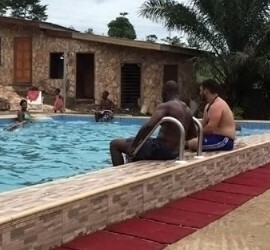 We are only a 30 minutes drive from Accra airport and only 40 minutes from the beach.